JULIA SPENCER-FLEMING: Dennis Lehane. Walter Mosely. Gillian Flynn. Al Lamanda. This past year, I had the pleasure of being on the Edgar Award committee for the Best Novel of 2012. Best Novel is the Big Enchilada of the Edgars, a tight competition where the established greats of the mystery world meet with the most acclaimed up-and-coming authors.Veteran writers like Ace Atkins, and brilliant young novelists like Jesse Kellerman and Lyndsay Faye. And Al Lamanda. --Al...what did you say that last name was? Judges sign a pledge to not reveal the goings-on of their committee. But I don't think I'm giving away too much to say that when we received a book from the very small Gale/Five Star Press by an author none of us had heard of, we didn't expect it would stun us all with its chiseled prose, bullet-velocity plot and achingly vulnerable protagonist. SUNSET was a standout; literally - given the number of books we received and the number of final nominations - one in a hundred. It turns out, of course, that Al had been earning his stripes all along. He's the author of some twenty novels which have been getting rave reviews from Publishers' Weekly and Kirkus all along. Next up is SUNSET's sequel, SUNRISE (which I've read. It's terrific.) Today, Al's going to tell us how he set his feet on the path that led to the Edgar Awards Banquet. 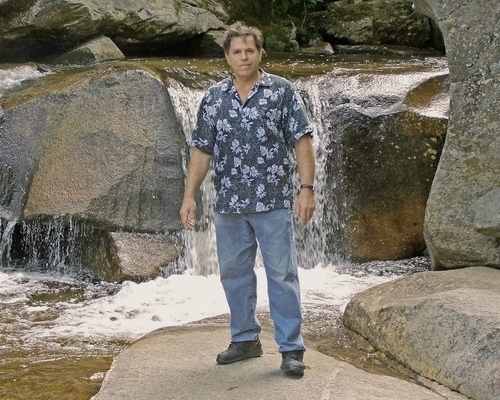 I’m a born and raised New York City boy so naturally it came as quite an adjustment when my wife and I moved to a secluded area in Maine during the summer of ninety-seven. Oh sure, I had seen trees before, Central Park is full of them, but who knew they shed in November and you’re supposed to pick up their litter and haul it away? Up to that point, I’d never owned a rake, or a shovel, an ax or a hose and as I found out a few months later out of necessity, a snow shovel. One thing my new home provided that the city did not was a peaceful, very serene setting, the ideal environment in which to write my first novel. For years I had wrestled with the burning desire to write a novel and now I was going to do it. All I needed was a plot, compelling characters, exotic settings and 75,000 words or so. I had yet to buy a home computer, but I did have a nifty Brother typewriter and a six-pack of white-out. And a ream of blank paper. That stayed blank for months. Devising a plot with compelling characters in exotic locations is a bit more difficult than you might think. So my first winter in Maine rolled in and my ream of paper sat untouched. It snowed. A lot. My two front teeth weren’t on my Christmas list, but a snowplow for my 300 foot long, up hill driveway was. Then it did something funny. It quit snowing and started icing. Ice is supposed to be something you put in your glass and not on your windshield, but I guess Mother Nature didn’t get that memo. The ice storm lasted seven full days and nights. By the third day my driveway was a sheet of ice. I needed ice cleats and a long walking stick to check my mailbox, resembling Moses in cleats as I hiked up to driveway. Power went out and the secluded little area was thrust into total darkness. Fortunately for me my wife is a country girl and knew how to make a fire in the black thing in the corner that she called a wood stove. We put our food outside on the deck (note: use a cooler as I discovered small animals are lurking about and they like to eat what I like to eat) so it wouldn’t spoil and I cooked on the wood stove. Leaving the house was out of the question as my car wouldn’t make it up the long, ice covered driveway and it was a ten mile walk to the nearest store. Then, on the fourth day of the ice storm, trees started to fall. I mean honestly, who knew that trees could just fall without the benefit of an ax, and a burly guy wielding it, but fall they did and on a regular basis for days on end. When that first tree fell, it made a sound like a baseball hitting a bat. A loud crack, followed by a loud crash. I ran to the window. A birch tree in the yard just missed the house. Then another and another came down and a news report on my portable radio said it was because the ice caused the trees to become brittle and the weight of the ice caused them to snap. So the snapping went on for a few more days and my yard resembled a giant box of Lincoln Logs tossed about. On the morning of the sixth day of the ice storm, I looked out my window after another snap and crash and I spotted my elderly neighbor walking into my yard. A tree had just missed his house. To protect himself from falling trees and branches he had a giant spaghetti pot on his head. I didn’t know if I should laugh or cry at the sight of this man and his spaghetti pot and when I went outside to greet him he said, “This storm is a killer,” and an entire novel flashed before my eyes. Ice. Storm. Trapped. Trees. Danger. Seclusion. Killer. And I sat down and wrote my first ever published novel, Dunston Falls. And if it weren’t for the ice storm of ninety-eight and a giant spaghetti pot I may never have written my Edgar nominated mystery novel Sunset. So when people ask me what inspires me to write, I usually tell them life. That, plus a big damn spaghetti pot. Want to talk about what inspires your writing, dear readers? Perseverance? Fifteen-year-long overnight successes? Maine? 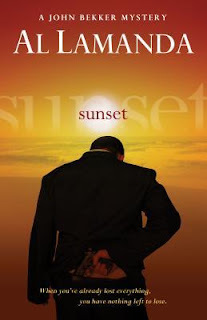 Join the discussion on the backblog for a chance to win one advance reader's copy of SUNRISE and one trade paperback edition of ONE WAS A SOLDIER by yrs truly. You can follow Al Lamanda on Twitter, as @lamandaal and friend him on Facebook. Who knew we’d be thankful to an ice storm and a spaghetti pot for wonderful mystery books? Congratulations on the Edgar nomination . . . I’m definitely adding “Sunset” to my mountain of to-be-read books . . . .
A big damn spaghetti pot--hey, whatever it takes, right? 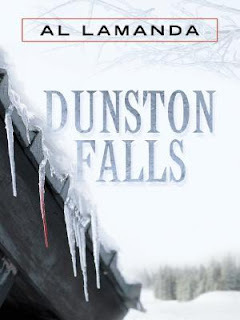 Durn, now I have to find "Dunston Falls", in addition to "Sunset"! What's funny is that my next door neighbors, who've become dear friends over the years, moved into their house (from Colorado)just a week before the Great Ice Storm of '98. Our first face-to-face introduction came after the ash tree in our side yard split down the middle and hit both our houses. Congratulations on the Edgar nomination and thanks for sharing your Ice Storm of 98 tale. The stories that grew out of that particular storm still amaze, and yours is one of the best I've heard. That long and icy week I was in the middle of a huge deadline-driven project at work, and there was power in downtown Portland, so I spent the week creeping back and forth from my home on Peaks Island to my office in the Old Port, using ski poles for stability. The boat was easy, but walking was an adventure. My neighbor is alive and well at 82 and still uses the same spaghetti pot as he did during the ice storm, only now just for cooking. Thank you all for your support, it is greatly appreciated. We used to live in Ohio and Minnesota--not bad for a native Texan. I enjoyed the snow; my husband was less enthusiastic. I think it had to do with his having to clear the driveway. Anyway when we were returning to Texas after an absence of 25 years, more or less, my husband looked absolutely jolly when he sold the snowblower. Your books sound intriguing, Al. I will have to look for them. Welcome to Jungle Reds, Al! Great story! Isn't it amazing how, when we've thought long and hard and tried to work for something with nothing, nothing, nothing, some random little incident will trigger this avalanche of ideas that make up the whole premise for a book? Congratulations on the Edgar nomination! I'll add your books to my TBR list and move them to the top. What inspires me to write? It's different things with different books. Sometimes an image will coalesce all these thoughts and ideas. Sometimes it's something I've overheard in a public place. Sometimes a situation that bothers or interests me. But always it only turns into the idea for a book after I've done a whole lot of work, usually on character. Absolutely wonderful blog. During the Ice Storm of '98, I was here in Austin Texas....it got cold. I believe the idea of a pot as a helmet to protect your head from falling trees is a good one. I am going now to check on your books. I believe after reading this blog it will be necessary for me to get one. You are a fun writer. Welcome Al, what a great story! congrats on the Edgar nom--that is a great honor. Love the pot! I can't believe you've stayed in Maine after that--one thing I hate most of all is ice. Oh, Al, this is a fabulous story! I burst out laughing imagining it! Next Edgars, let's all wear spaghetti pots. It's a dangerous world! A spaghetti pot and a Maine ice storm? Al, I have no idea how I've missed your books before now but I'm going to change that. Congrats on the Edgar nomination! Well, add me to the list of those who're adding you to our TBR lists!! And big congrats on your Edgar nomination. Here in Northern California's Santa Cruz Mountains we don't get ice storms, but along with earthquakes we get snow and power outages. They certainly make life interesting. Thank you all for your wonderful comments. I really do appreciate it. 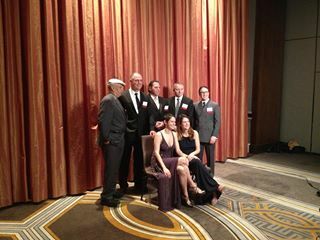 The highlight of the Edgar Awards, for me, was getting to meet and talk with so many wonderful and talented writers. Dennis Lehane is not just a great writer, but a great regular guy to have a conversation with. With a litttle luck maybe I'll get to back one day. My "inspired" story involves a five-week house swap in Australia during winter, on crutches with a cast, after just having broken a foot and had surgery - an excellent formula for learning to rewrite. Al, can't wait to dive into your books. Thanks for a great story (I spent one week-long ice storm trapped in a friend's wine store and deli in Vermont - no joke). How have I never known about all the fabulous writers in Maine? I can't wait to read your books. I remember the ice storm but only the aftermath. We spent that winter in a motorhome touring the US and came back to find my Honda covered with snow and ice. (We parked it in the backyard in the path of the snow falling off the roof.) But, son of a gun, it started on the first turn! Thanks for letting us learn more about you!